A collection of essays from trans and nonbinary people who use human-powered modes of transportation. 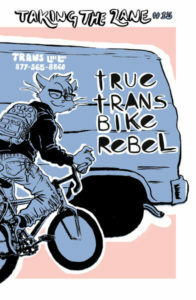 A collection of feminist bicycling science fiction, by trans and nonbinary creators. Currently slated for publication in late 2020. Submissions open until November 15, 2018. An in-universe spin-off of the web series RWBY that follows a group of side characters through the events of the first three volumes. A humorous reimagining of the first three volumes of the web series RWBY as a D&D game being played by the title characters of the show. Second person stories that delve deeply into minor characters from the web series RWBY. Expanding on existing canon, this piece is a non-linear look at how side characters from RWBY may have gotten to where they are.